2 ingredients is all you need to make these fun and delicious Dr Pepper Cookies! Every Dr. Pepper Lovers dream! Add a simple glaze and sprinkles for a tasty treat! Dr. Pepper is one of those iconic drinks that you either love or hate. The Dr. Pepper lovers of the world are loyal and choose it over all other fizzy drinks. 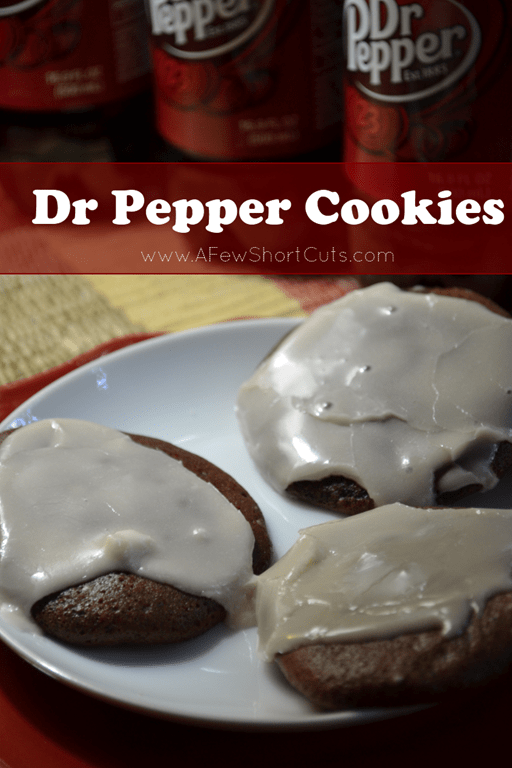 I have seen Dr Pepper flavored lip gloss, Dr Pepper Cake Recipes, but these Dr Pepper Cookies are a big winner! Dr. Pepper and a chocolate cake mix is all you need to work your magic for these Yummy Dr Pepper Cookies. I have even made them with a Gluten Free Chocolate Cake Mix. They turn out chewy and cake every time. They are chocolatey with that Dr Pepper flavor that everyone loves! Whip up this simple Dr. Pepper Glaze to dip your cookies in and then top with a few fun sprinkles. Sprinkles make everything better. Such a fun cookie to put in your cookie jar or to give to the Dr. Pepper lover in your life. 2 ingredients is all you need to make these fun and delicious Dr. Pepper Cookies! Every Dr. Pepper Lovers dream! In a large bowl mix chocolate cake mix and 6 oz of Dr pepper. Stir until well combined and the consistency of cookie dough. If necessary add a little more Dr Pepper. Stir in 1 cup of chopped pecans (optional). Scoop into tablespoonfuls onto parchment lined baking sheet and bake for 10 minutes. Whisk together powdered sugar and Dr Pepper until you achieve your desired glaze consistency. Yes, you can use Diet Dr pepper. I am sure this works with other sodas, but I haven't tried. You can use a gluten free cake mix for these cookies. HOWEVER, gluten free cake mixes tend to be smaller than regular ones. Start out with only 3 oz of Dr. Pepper until you get the desired cookie dough consistency. So, do these taste like chocolate cake or Dr. Pepper? Angela, they taste chocolatey, but you can taste the dr pepper flavor. Think you could use vanilla cake instead of chocolate? Ashley – I just made them with a box of yellow cake mix because that’s all I had. I added 2 – 3 T of Hershey’s cocoa powder to make it chocolate-y. They turned out pretty good but next time I’m going to add chocolate chips instead of the chopped pecans. ooh let me know how they turn out with the chocolate chips. i was wanting to make them with the chocolate but didnt know how it would taste. I made these today. I used a german chocolate cake mix and diet cherry dr. pepper. They turned out really good. The only thing is, I had to cook them for about 15 minutes or they were still too soft to lift out of the pan. Think I might try an orange cake mix with diet orange sunkist. I’ve done that combo! It’s one of our favorites – I use a french vanilla cake mix with diet sunkist – it tastes like a creamsicle! I’ve never made them into cookies though, just cupcakes! I wanted to make “mountain dew cookies” so I used a lemon cake mix and mountain dew. Perfection! Recipe does not need tweaking one bit. Except glaze—don’t measure, just make it how you like it. Next I want to make ginger ale cookies with a spice mix, and add powdered ginger to the glaze. You can make a soda pop cookie party tray– dp, md, coke, root beer, ginger ale, and orange crush— add sprinkles to identify flavor. For coke add cola flavor to glaze and for root beer add root beer flavor to glaze. 10 mins is perfect–drag paper off pan then scrape off with metal spatula when cooled. Parchment paper necessary! So just the cake mix and dp? My husband drinks nothing but DP so I am going to have to give these a try for him! Thanks for sharing this recipe! Stopping by from Gooseberry Patch Recipe Round Up! the glaze measurements don’t seem right. They probably are…. the powdered sugar practically disappears into a very small amount of liquid. So just cake mix and Dr. Pepper? No eggs or anything that goes with the cake mix?? I am going to make these without the glaze and send them to my husband overseas. I hope he loves them. Thanks for the recipe! Can you make them with yellow cake mix without adding cocoa powder? For someone who doesn’t like chocolate…would they taste bad? I have the funfetti cake mix and that’s all but would that taste bad with diet cherry dr pepper?